Hydrating mists are the perfect way to give skin a boost, ideal for rebalancing dryness or giving tired skin a pick-me-up in one gentle spritz. While Mario Badescu Facial Spray with Aloe, Herbs and Rosewater is a staple at my bedside, I also have an affinity for Shu Uemura’s Skin Perfector mini-mist is part of my personal top shelfie! 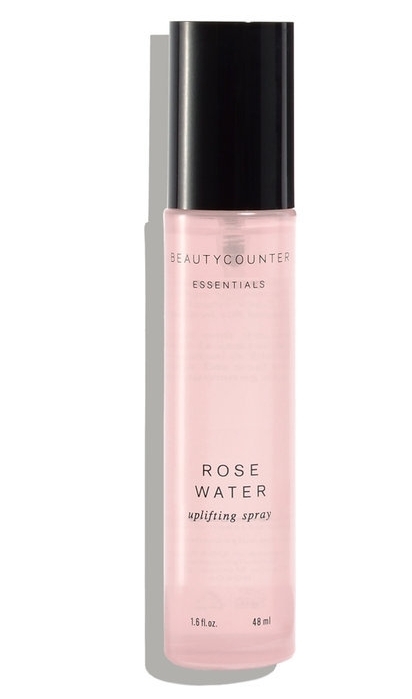 Beauty Counter’s Nourishing Rosewater Mist will wake up your complexion. It’s made with organic rose essence, purified water, and moisturizing sodium hyaluronate. Spray it on a cotton pad and swipe across your face to remove impurities. It can also be spritzed on the face whenever skin needs a refreshing pick-me-up. I also fangirl over Herbivore’s Rose Hibiscus Hydrating Face Mist. It’s a blend of coconut water infused with naturally humectant Hibiscus Flower Extract and moisture-enhancing Rose Water to refresh and hydrate skin. Formulated for all skin types. So, why should you use a facial mist? The mists can help to balance and refine skin’s tone and texture after a long day. Simply spritz before your lunch date or staff meeting for a refreshing feel or pop into the ladies room on a hot summer day and refresh your skin before that hot date! Toning mists help to protect skin against the effects of oxidative damage with a shielding barrier of antioxidant protection and helps tighten the appearance of pores. Basically, the water and botanicals in the mists are directly feeding your skin. Ever notice that your liquid foundation is gone before you get to work? Or perhaps your shining before you get to the bus? A spritz will help to regulate the skin and even make a powdery makeup finish look more natural. Facial Mists are the secret to refreshing your makeup without having to completely re-apply.